A lot of people will recognise the name Sam Bowman from his work at the ASI. He blogs there regularly, is popular on Twitter and makes the occasional media appearance. He has written on gay marriage for the Guardian, the living wage for Conservative Home and many times for City AM. A lot of you will have met him at an ASI event, where he manages to present a mathematical puzzle by both working the whole room and being accessible, but also apparently having the time for a serious conversation with complete strangers. From one such conversation I know Sam is an ethical consequentialist, believing nothing has fundamental value one way or another except as determined by its consequences. There is at least a twenty minute talk in there about whether or not that view is valid on its own, and probably at least another 10 minutes about whether that view is compatible with my own view. That, however, would be something of a diversion from Thursday’s topic which is a review of the minimum wage debate, where it has got to and what the empirical evidence has to say about it. Like Sam, I started off in a crappy job. I worked on the checkout in the Coop, Sam served french fries in MacDonalds. These are stages in your life that you simply have to go through, either because preparing for anything more is not yet possible, or in order to prove you are a hard worker and that you know how to get on in the workplace. It is people that do this and succeed that rise, and those that don’t stay where they are. How are employers to distinguish those that don’t, from those that were not permitted to try under a minimum wage law? More recently, Sam appeared on the BBC World Service to debate Will Hutton, the writer and Oxford college principal. Predictably Sam was introduced as working for a right-leaning think tank and Hutton was introduced as an unlabelled economist. Predictably, the presenter interrupted Sam but Will got to ramble on in a relaxed manner for ages. Sam did very well though and managed, just for instance, to get out the idea that the disemployment effect is at least as serious a moral issue as low pay might be. He also told the World Service that a consensus of good empirical research notes a disemployment effect from the introduction of a minimum wage, something that Hutton seemed to dispute. So I figured it would be a great idea to give Sam the chance to tell us all about this, uninterrupted, for a good 20 minutes, so that we can learn more about the empirical details. Sam Bowman is speaking this Thursday 6th March at the Rose and Crown. If you’re there, Rocco, do introduce yourself – I’d love to chat about this with you. We might not agree but I’m sure we’d both enjoy the conversation! That’s terribly kind of you, Sam. But I can’t make it, I’m afraid. Nevertheless I’m sure that there will be libertarians in the room with you that evening. Perhaps one of them might bring the subject up. Anyway, break a leg, dude! How magnaminous Rocco! Why don’t you make it easier for us poor souls by providing a link to what you found objectionable? But you could ask Sam yourself, if you like. It’s not like he keeps his fondness for redistribution a secret after all. I can’t reply to Rocco below but, as in many other things, I basically take the same view as Milton Friedman and FA Hayek. I think Rocco’s main point is a semantic one – his view is that the word “libertarian” implies a strict adherence to the Non-Aggression Principle. I think that’s incorrect, but it’s a fair view to take. Our bigger point of difference is that I think the debate is pretty unimportant, whereas he thinks it’s very important. Thanks Rocco. It helps to see what *you* found objectionable. And I must say Simon, I really wouldn’t have thought that finding these things objectionable would make me the bad guy on Libertarian Home. Anyone could could Google “Sam Bowman redistribution”, but I wanted to an example from yourself, since you struck an emotive tone. Emotive discussions benefit from specificity. Incidentally, you are not a bad guy, in fact I am inclined to agree though I am yet to make up my mind fully and doubt that I would not have invited Sam Bowman even if I had. I have very little time for the idea that people who are in favour of a smaller government should reject an association others like themselves over small differences (I depart radically from Rand on that point). I also doubt Rawls has much to offer on morality nor the core Bleeding Heart Libertarian community on the form of the proper end-goal, but the idea that we should shift our focus to more positive and saleable aspects of the libertarian agenda is sound, as long as we do not permanently abandon the rest of it, nor short-sightedly disclaim it. Meaning that we continue to be anchored by the Non Aggression Principle. Are you sure that advocating the State rob people who have (according to whoever it may be) ‘more than enough anyway’ is just a “small difference”, Simon? To my ears at least, it sounds like a radical departure from a political philosophy anchored by the non aggression principle. Yeah? Maybe I misjudged the tone of “what *you* found objectionable”, Richard. But, given the withering tone of Simon’s first reply, it looked like he meant that I was wrong to find wealth redistribution, etc, objectionable. Thanks, Richard. I really appreciate that. Rocco, this quote is so funny, (I’m not mocking you, it really is funny)! Man, I love your attitude! (I’m serious). Have any of you come across this satire by the way? (I find this really funny too). 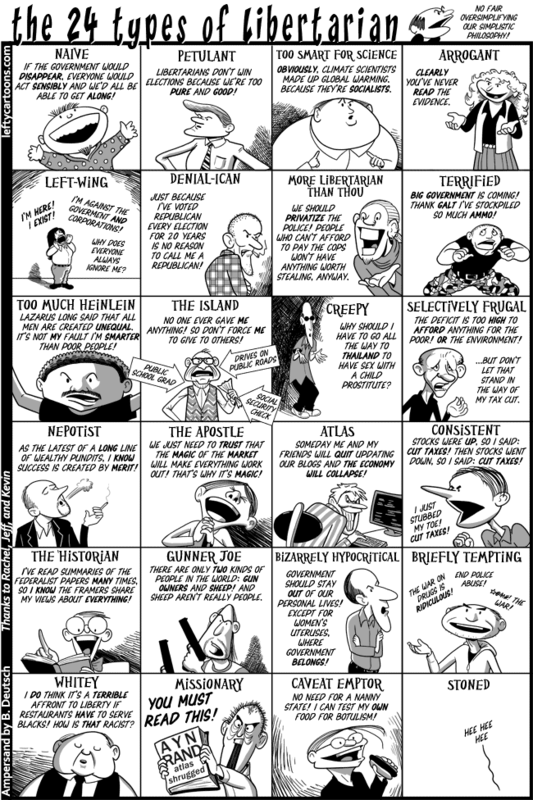 It sums up what Libertarians are seen as. It’s definitely important not to lose one’s principles, but I agree with BHLs, and think that Universal Basic Income could very well act as scaffolding, (meanwhile we can advance other Libertarian pawns, as well as gain understanding, hence gain momentum into other areas, from people who don’t identify themselves specifically as Libertarians), until we eventually take away the basic income scaffolding when society has become free from regulation, taxes, aggression, fraud, etc., and is more or less sustainable – much, much more sustainable than now. When time comes, taking away the basic income may be very difficult to do, unless a majority has come to value free market economics… the biggest challenge perhaps is not to weaken the spirit of the Non Aggression Principle, which is the end goal, and I depend on people like you Rocco to keep the fire burning.